Our Yorkies come from the TOP Canadian champion bloodlines with some distinguished European lines also. Yorkhaven yorkies are smart, cuddly and have exceptional beauty with excellent conformation proven by their show record. We strive to do the best we possibly can for this outstanding breed, taking great care with genetic decisions in order to produce the healthiest dogs with the best temperaments for you, for other show exhibitors, and for us. All of our breeding dogs are health tested for every DNA test currently available through Embark Veterinary, a Cornell University research partner. We offer quality pet puppies for the pet oriented family, as well as outstanding show prospect pups (to qualified show exhibitors only). The advantage to those looking for that perfect pooch is your puppy comes from generations of “pick-of-the-litter” dogs from our breeding program, chosen for their outstanding qualities and health. 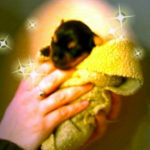 As such, your pup from us will look like and act like a proper purebred Yorkshire Terrier should; highly intelligent, social, brave, curious, with an aire of importance, and of course a bit mischievous! A Yorkie should be approximately 2.75-3 lbs at 12 weeks old, and a healthy adult size of 5-7 lbs. They are a perpetual playful puppy and very loyal to their person! Yorkies are one of the tiniest breeds but THINK they are big and will not back down from other dogs no matter what their size. It is important to keep them safe from harm. Contrary to what some sites may say, in my 35+ years with the breed, it’s my opinion they do not generally enjoy or trust the company of young children under age 12.